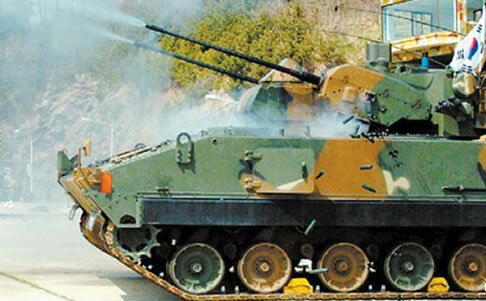 The Korean K30 Biho twin 30mm self-propelled anti-aircraft Gun belongs to the Korean K200 (AKA KIFV) family of vehicles. It uses an extended chassis to accommodate the larger D2840L engine need to power the vehicle as the AA turret/equipment doubles the weight of the vehicle of that of other K200 vehicles. The engine is 580hp and the vehicle also has a different transmission from other K200’s, the S&T Motors’ HMPT500-3EK/4EK. The vehicle entered production with Doosan DST, in 1996 and 176 vehicles have been built exclusively for the ROKA, which entered service around 1999. The Fire Control System comprises of an electro-optical targeting system (EOTS), panoramic periscope, forward looking infrared system (FLIR), laser rangefinder (LRF), thermal sight and a TV camera. 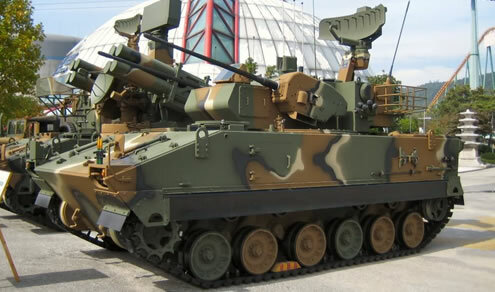 It also uses a TPS-830K radar of which supplies targeting information to the digital fire-control system to direct the aim of the electro-optical targeting system, which then aligns the 30mm guns with the target for accurate firing. The radar also features a real-time early warning, multiple target detection, and Identification Friend or Foe (IFF) subsystem, to activate self defence anti-chaff counter measure device systems. Cyclic rate of fire for a single gun is 600 rounds per minute. Each gun is provided with 300 rounds of ready to use ammunition. The K30 Biho fires HE-FRAG rounds against air targets. Effective firing range is approximately 3 km. The K30 has a high kill probability against low-flying airborne targets.